A SSESSMENT AND E LLS ESOL Awareness Workshop Wednesday, July 21, 2010. 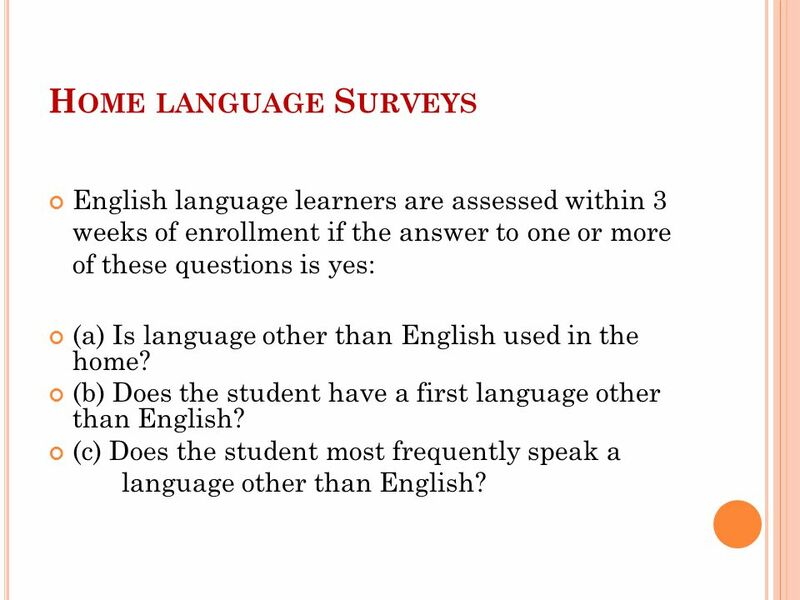 3 H OME LANGUAGE S URVEYS English language learners are assessed within 3 weeks of enrollment if the answer to one or more of these questions is yes: (a) Is language other than English used in the home? (b) Does the student have a first language other than English? (c) Does the student most frequently speak a language other than English? 4 C OMPREHENSIVE E NGLISH L ANGUAGE L EARNING A SSESSMENT (CELLA ) The CELLA is a language proficiency test designed to measure the English language growth that ELLs need to succeed in school (FDOE, 2007). 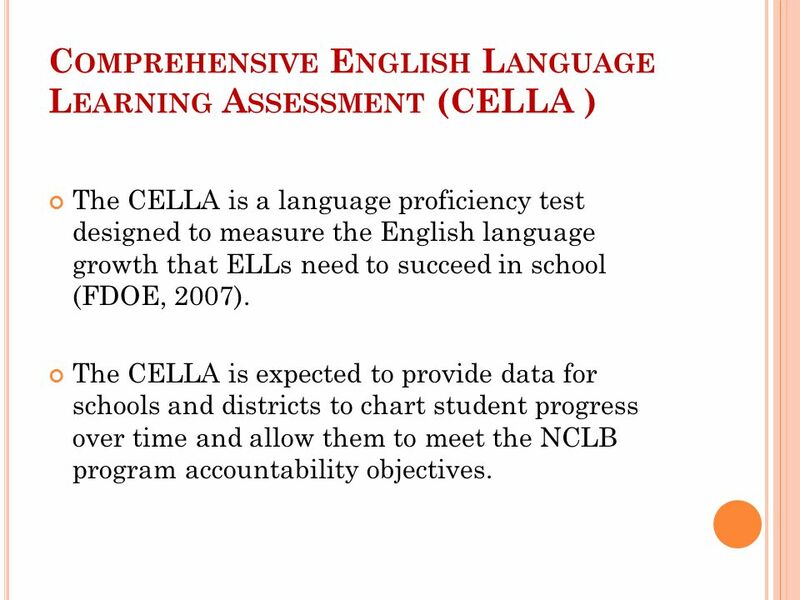 The CELLA is expected to provide data for schools and districts to chart student progress over time and allow them to meet the NCLB program accountability objectives. 5 CELLA, CONT …. 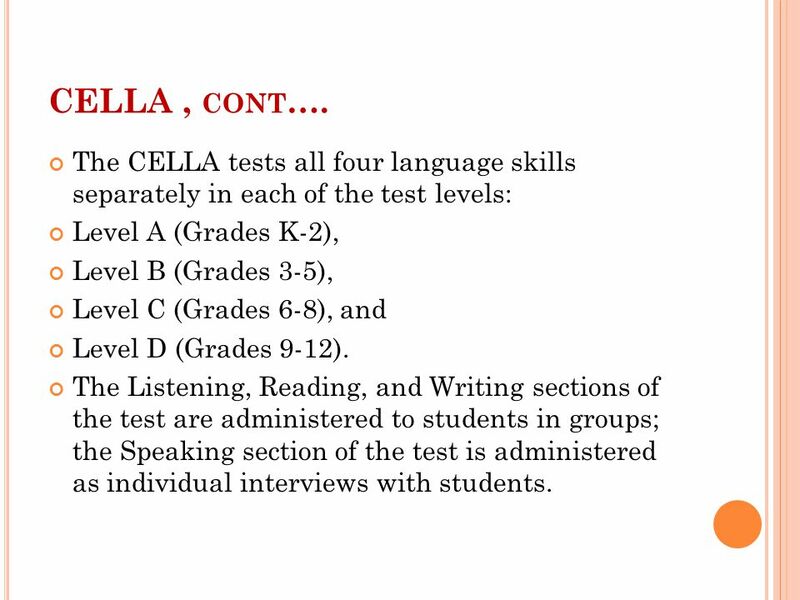 The CELLA tests all four language skills separately in each of the test levels: Level A (Grades K-2), Level B (Grades 3-5), Level C (Grades 6-8), and Level D (Grades 9-12). The Listening, Reading, and Writing sections of the test are administered to students in groups; the Speaking section of the test is administered as individual interviews with students. 7 ELL S AND FCAT, CONT …. 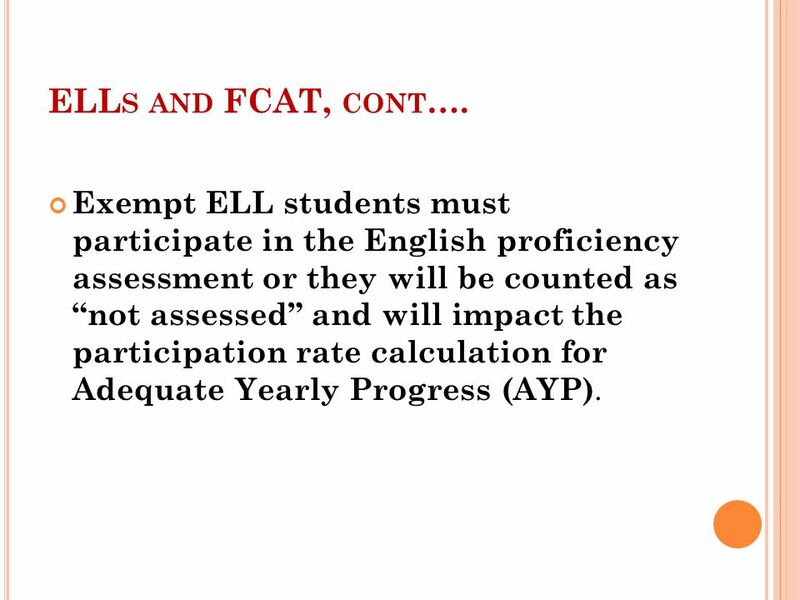 Exempt ELL students must participate in the English proficiency assessment or they will be counted as “not assessed” and will impact the participation rate calculation for Adequate Yearly Progress (AYP). 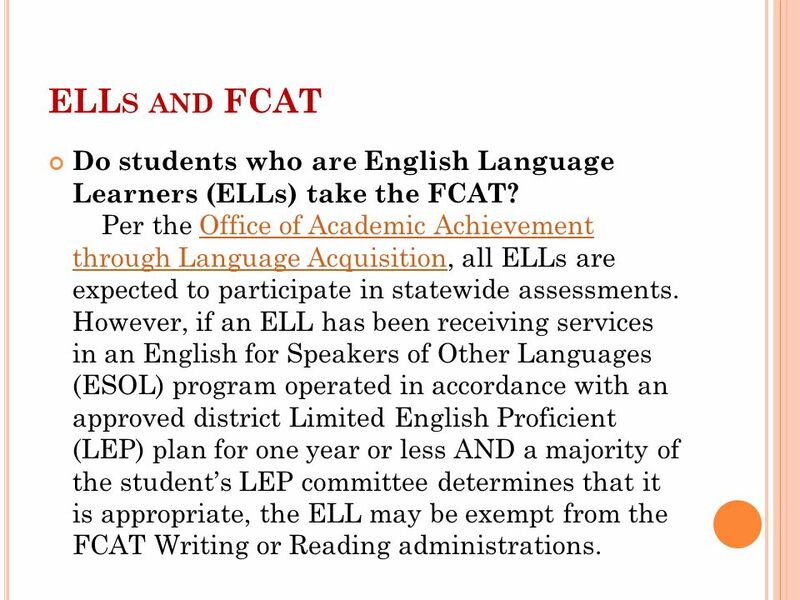 8 ELL S AND FCAT, CONT …. 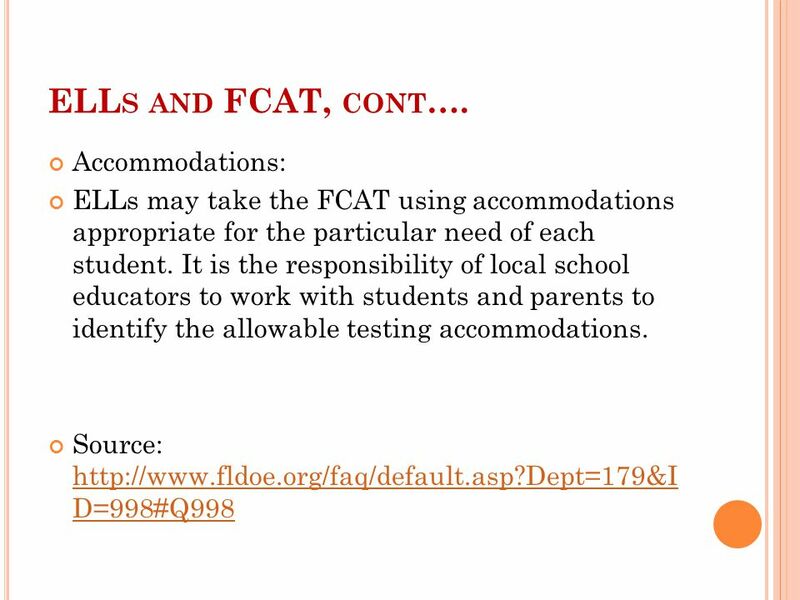 All ELLs are expected to participate in the FCAT Mathematics and Science tests no matter how long these students have been receiving services. 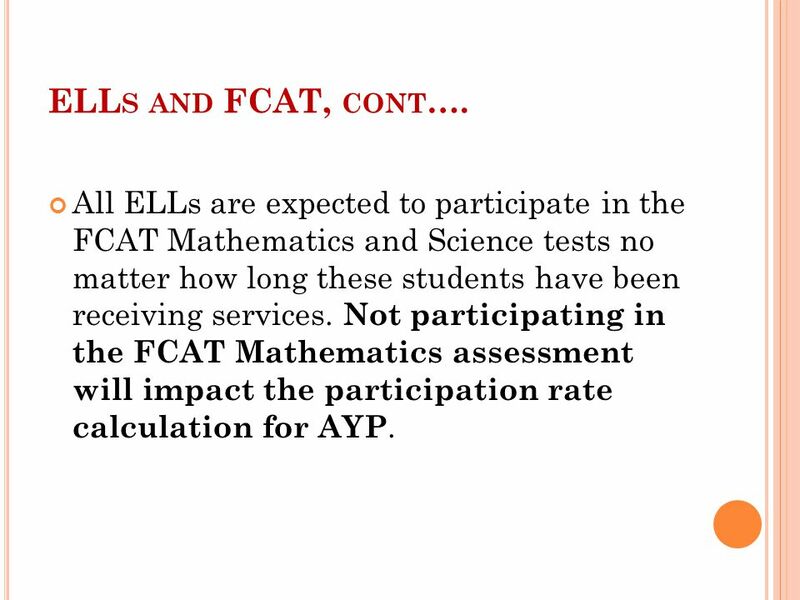 Not participating in the FCAT Mathematics assessment will impact the participation rate calculation for AYP. 10 A SSESSMENT AND B IAS Cultural Bias When a question includes reference to an item that requires knowledge of a certain aspect of culture in order to answer correctly, it is considered culturally biased. Avoiding culture references on reading tests is very difficult. 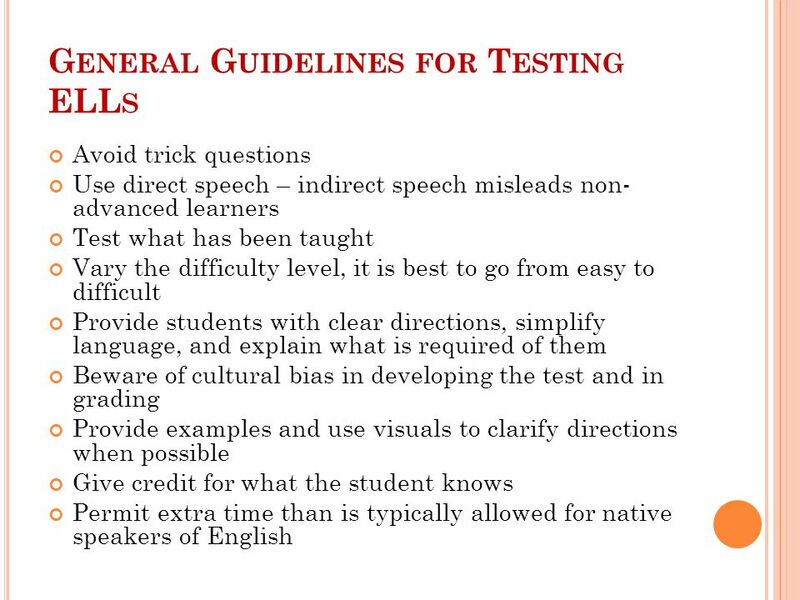 For that reason, teachers are asked to keep this in mind when evaluating tests of ELLs. 11 A SSESSMENT AND B IAS, CONT …. 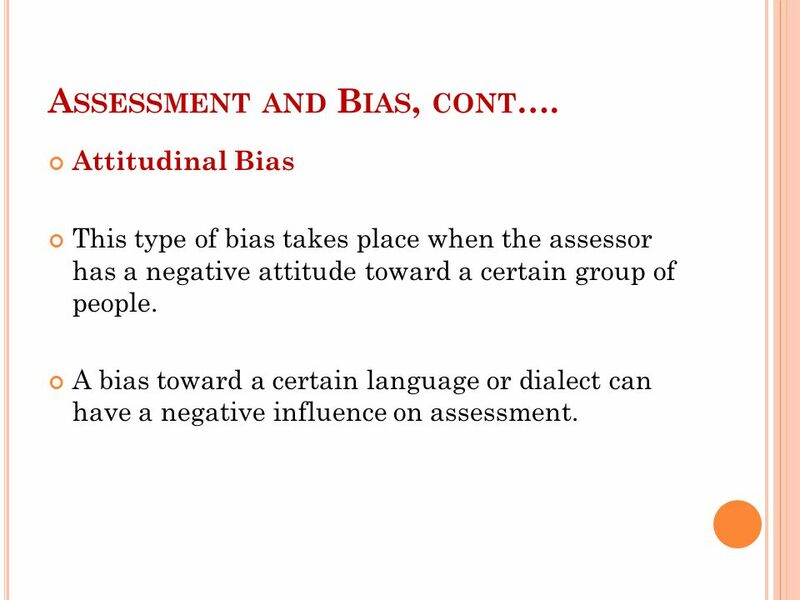 Attitudinal Bias This type of bias takes place when the assessor has a negative attitude toward a certain group of people. 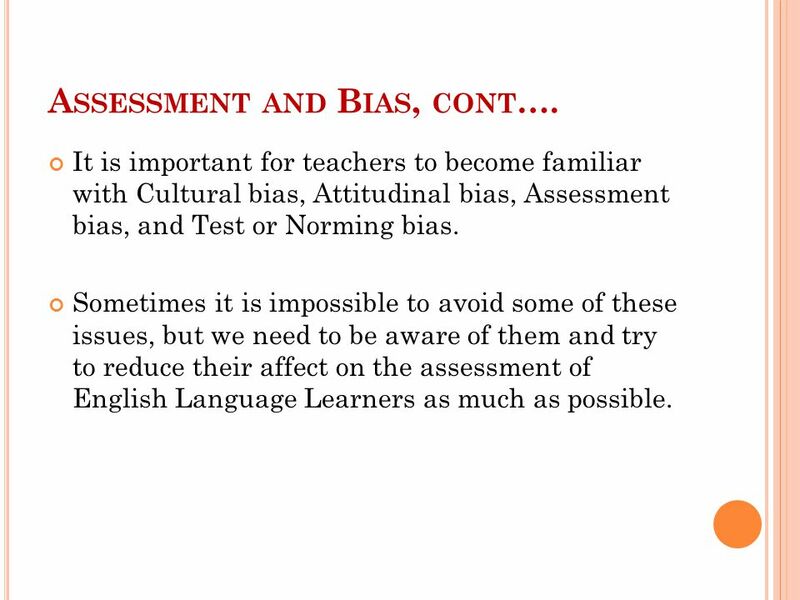 A bias toward a certain language or dialect can have a negative influence on assessment. 12 A SSESSMENT AND B IAS, CONT …. 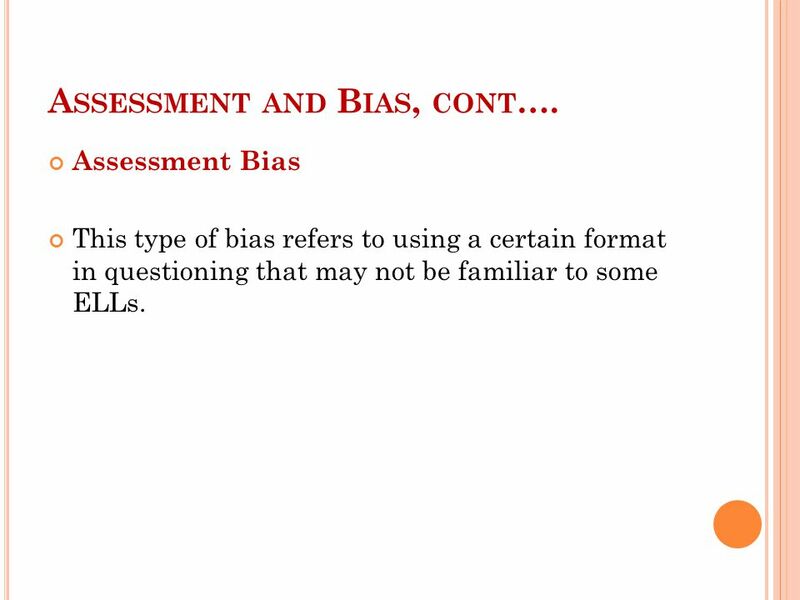 Assessment Bias This type of bias refers to using a certain format in questioning that may not be familiar to some ELLs. 13 A SSESSMENT AND B IAS, CONT …. 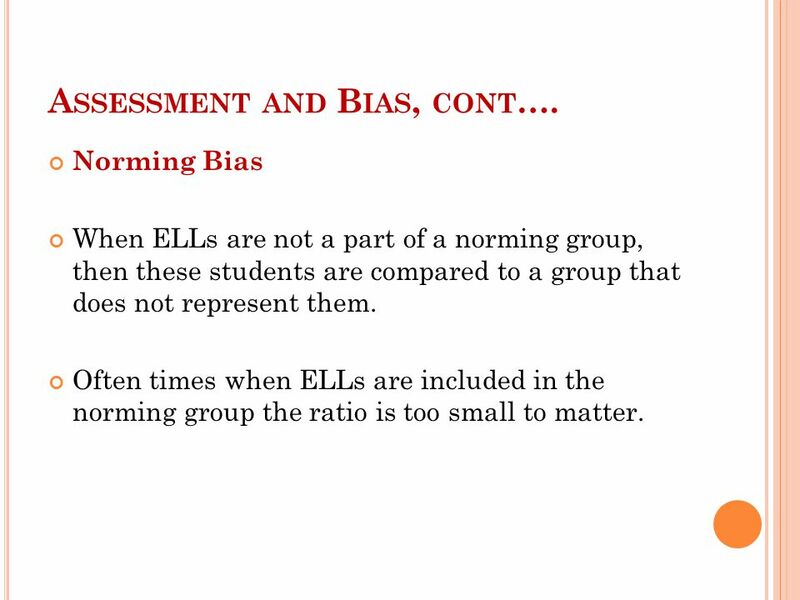 Norming Bias When ELLs are not a part of a norming group, then these students are compared to a group that does not represent them. 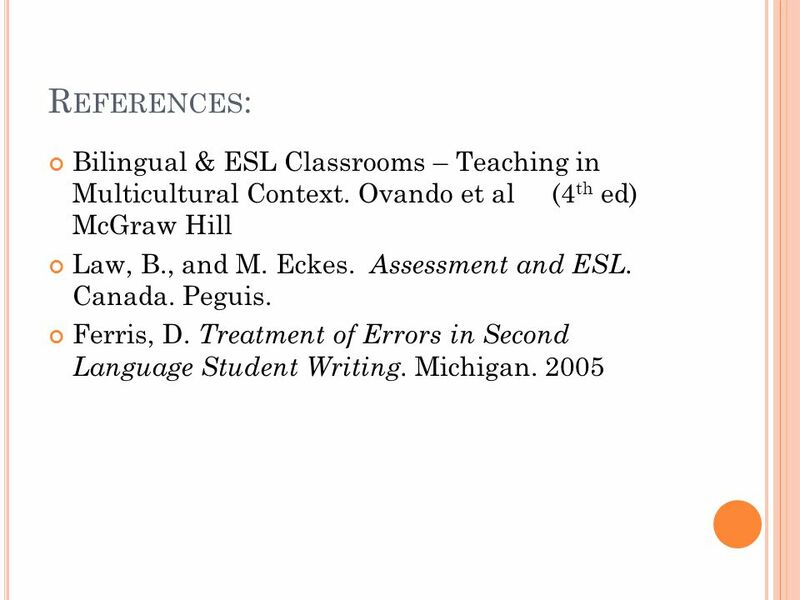 Often times when ELLs are included in the norming group the ratio is too small to matter. 14 A SSESSMENT AND B IAS, CONT …. 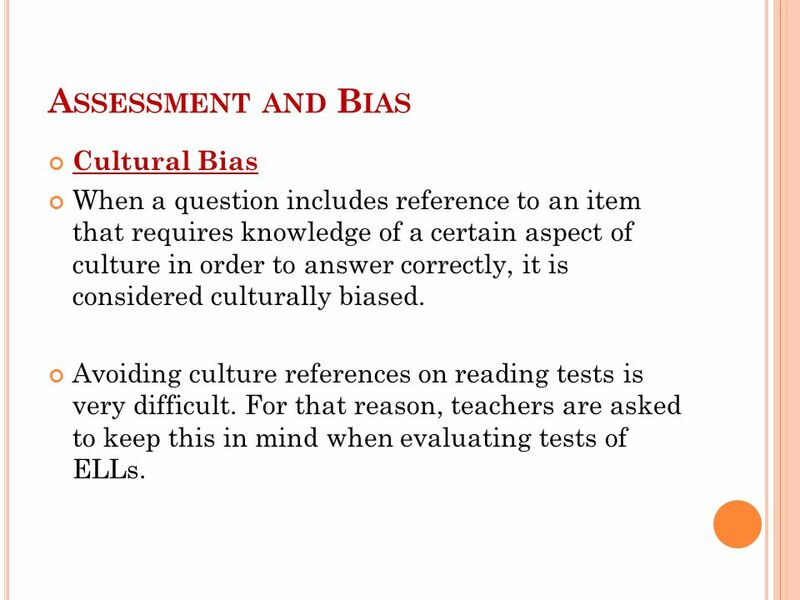 It is important for teachers to become familiar with Cultural bias, Attitudinal bias, Assessment bias, and Test or Norming bias. 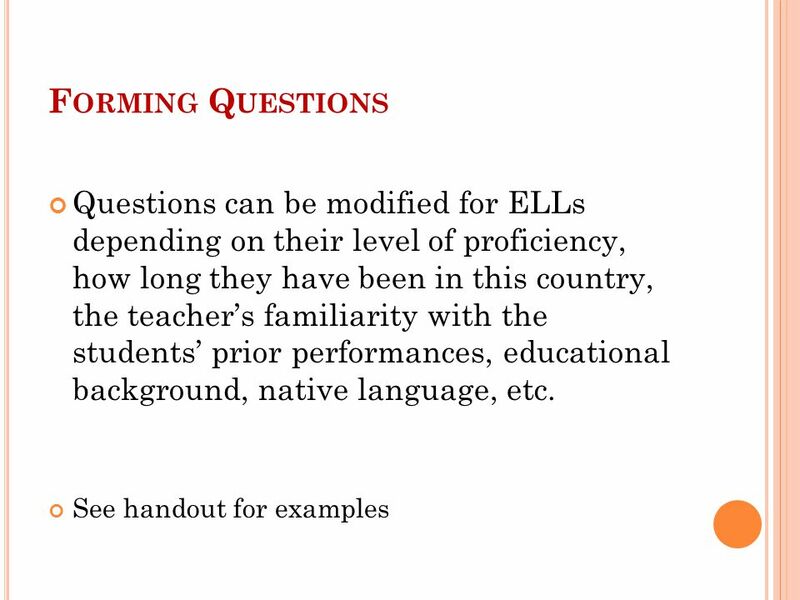 Sometimes it is impossible to avoid some of these issues, but we need to be aware of them and try to reduce their affect on the assessment of English Language Learners as much as possible. 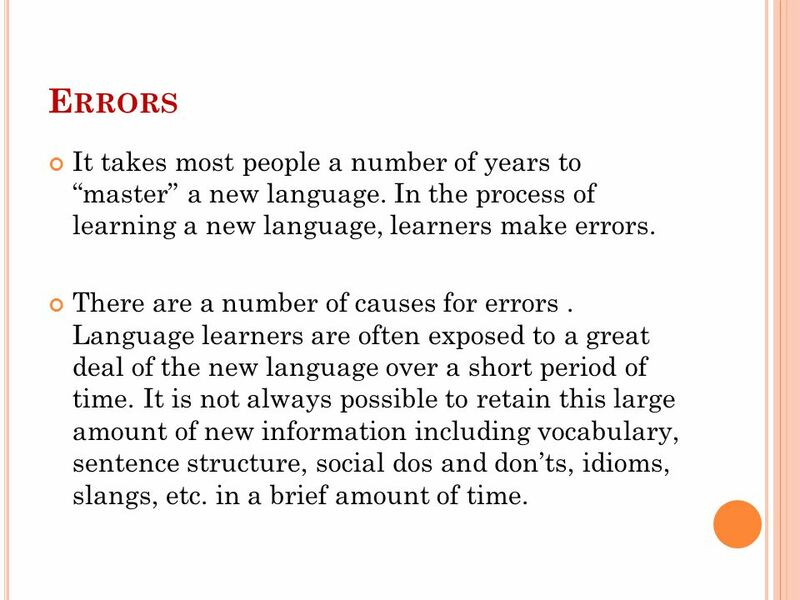 16 E RRORS It takes most people a number of years to “master” a new language. 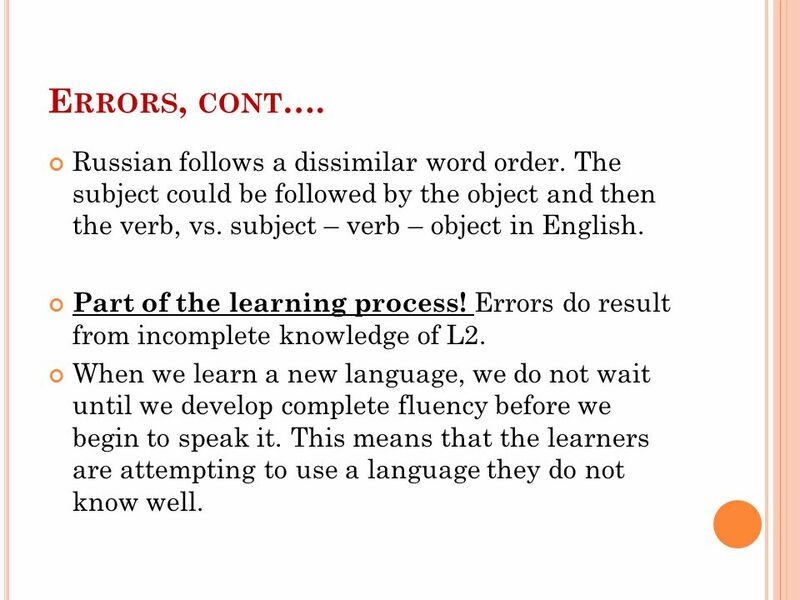 In the process of learning a new language, learners make errors. There are a number of causes for errors. Language learners are often exposed to a great deal of the new language over a short period of time. It is not always possible to retain this large amount of new information including vocabulary, sentence structure, social dos and don’ts, idioms, slangs, etc. in a brief amount of time. 17 E RRORS, CONT …. 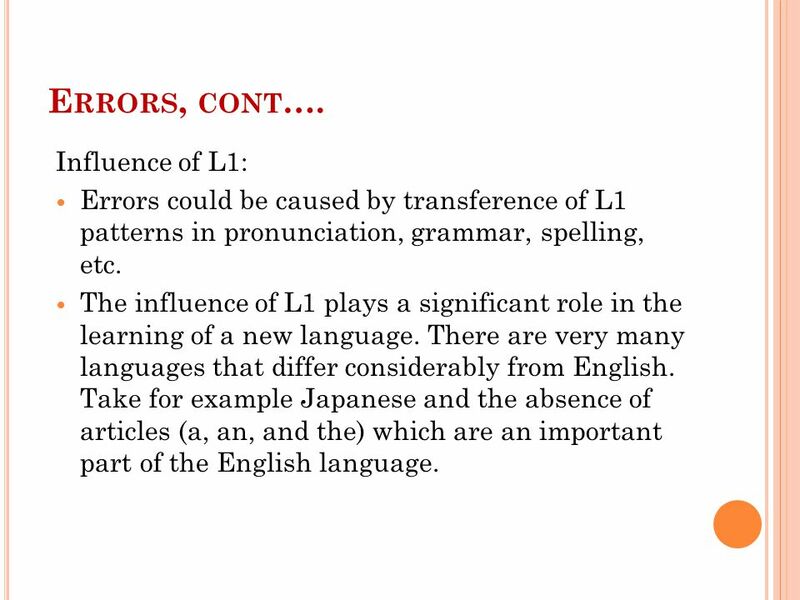 Influence of L1: Errors could be caused by transference of L1 patterns in pronunciation, grammar, spelling, etc. The influence of L1 plays a significant role in the learning of a new language. There are very many languages that differ considerably from English. Take for example Japanese and the absence of articles (a, an, and the) which are an important part of the English language. 18 E RRORS, CONT …. Russian follows a dissimilar word order. The subject could be followed by the object and then the verb, vs. subject – verb – object in English. Part of the learning process! 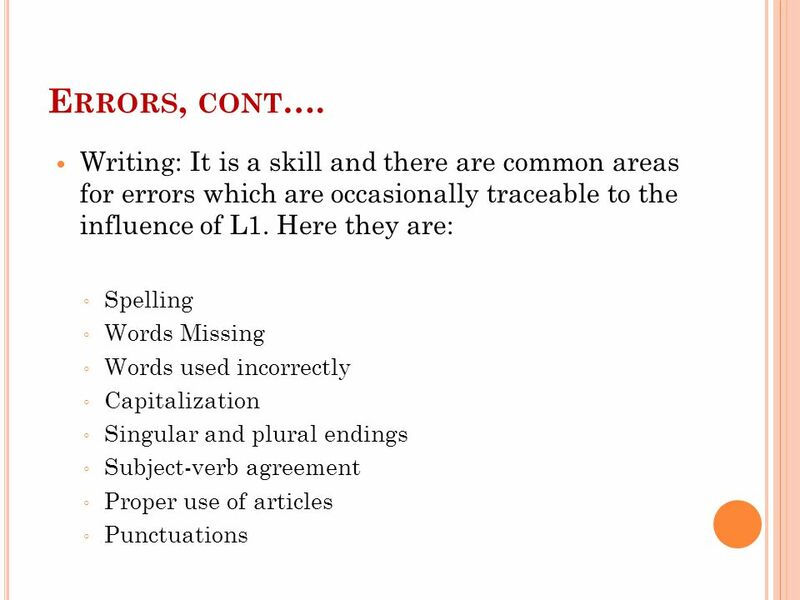 Errors do result from incomplete knowledge of L2. When we learn a new language, we do not wait until we develop complete fluency before we begin to speak it. This means that the learners are attempting to use a language they do not know well. 19 E RRORS, CONT …. The English language has many unconventional spelling patterns as well as words having more than one possible meaning. There are rules and then there are exceptions to the rules. 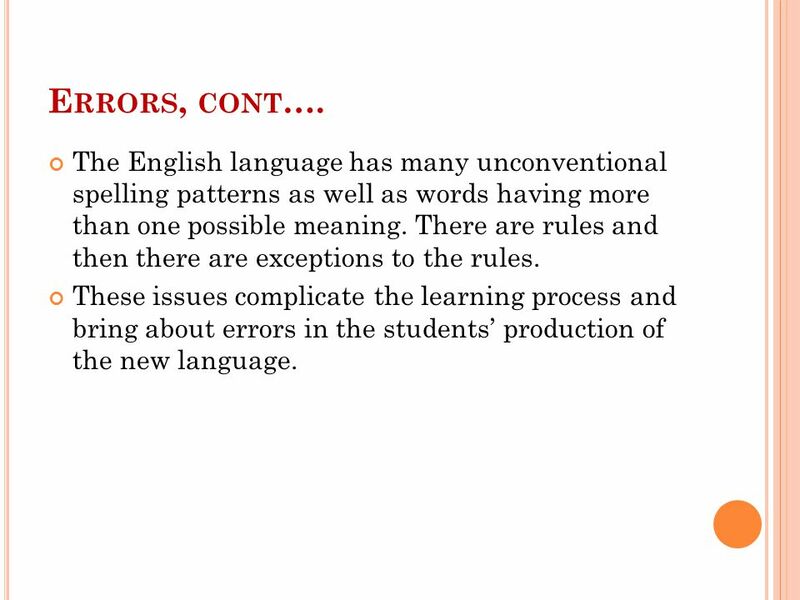 These issues complicate the learning process and bring about errors in the students’ production of the new language. 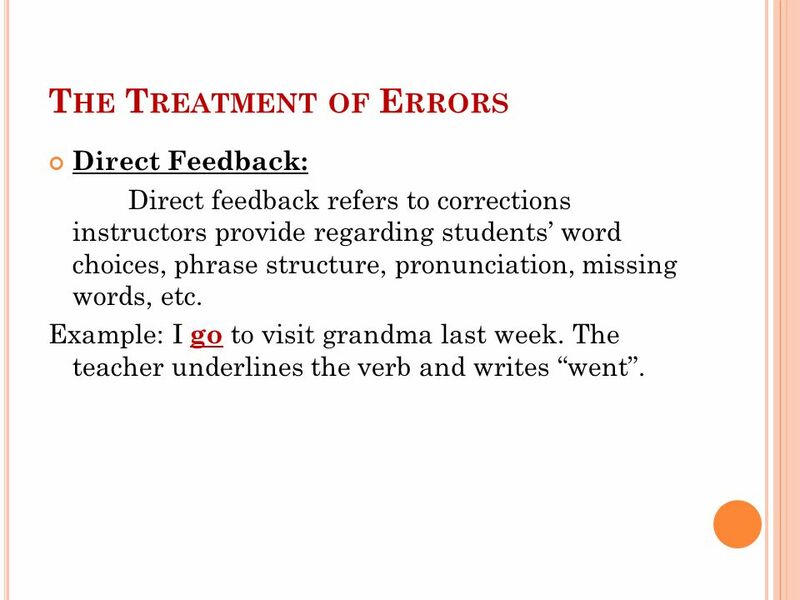 21 T HE T REATMENT OF E RRORS Direct Feedback: Direct feedback refers to corrections instructors provide regarding students’ word choices, phrase structure, pronunciation, missing words, etc. Example: I go to visit grandma last week. The teacher underlines the verb and writes “went”. 22 T HE T REATMENT OF E RRORS, CONT …. 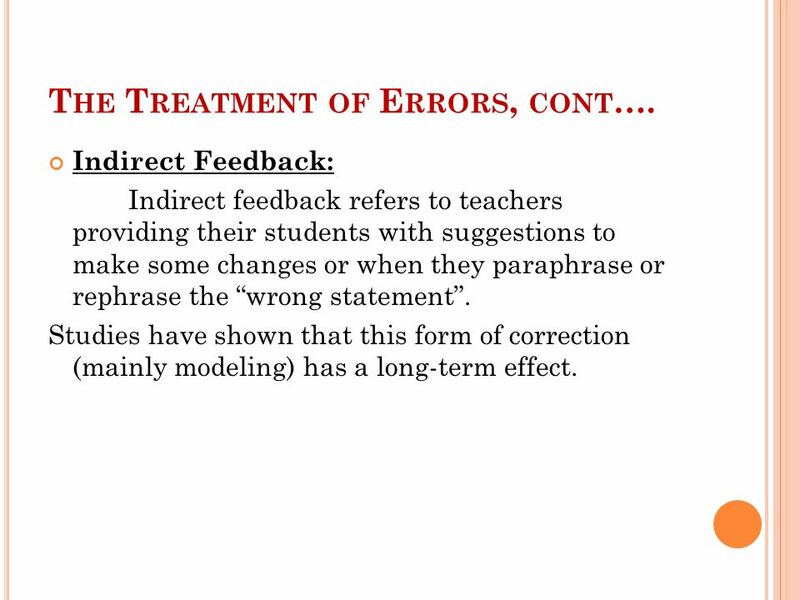 Indirect Feedback: Indirect feedback refers to teachers providing their students with suggestions to make some changes or when they paraphrase or rephrase the “wrong statement”. Studies have shown that this form of correction (mainly modeling) has a long-term effect. 23 T HE T REATMENT OF E RRORS, CONT …. When providing feedback, remember to provide students with explanations of the reasons why they should avoid the same errors in the future. 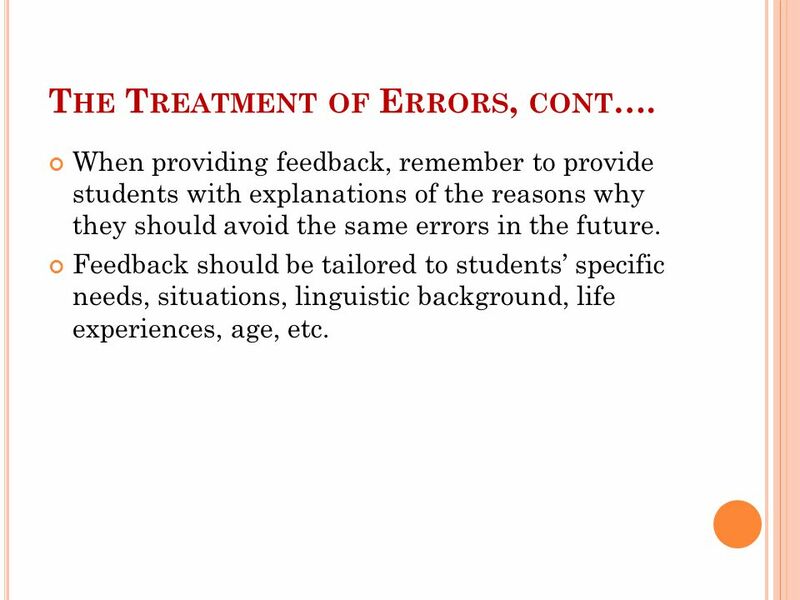 Feedback should be tailored to students’ specific needs, situations, linguistic background, life experiences, age, etc. 24 T HE T REATMENT OF E RRORS, CONT …. 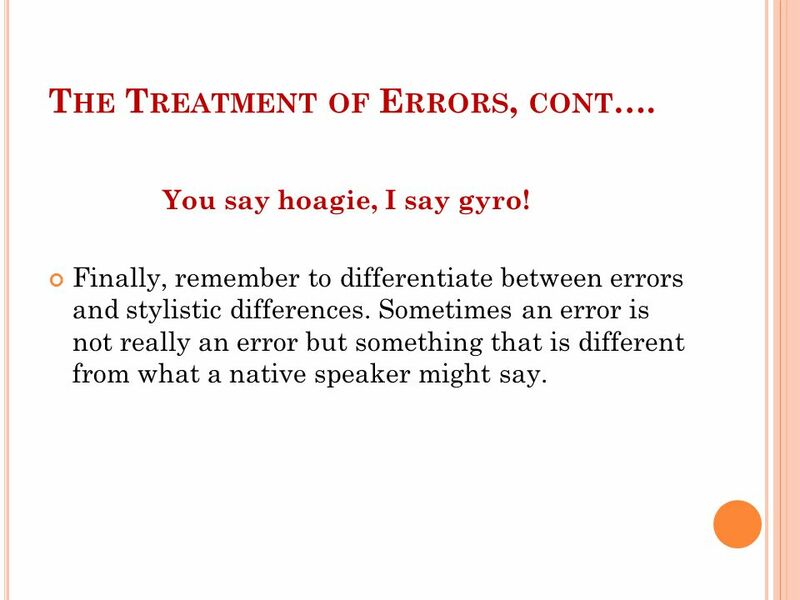 You say hoagie, I say gyro! Finally, remember to differentiate between errors and stylistic differences. Sometimes an error is not really an error but something that is different from what a native speaker might say. 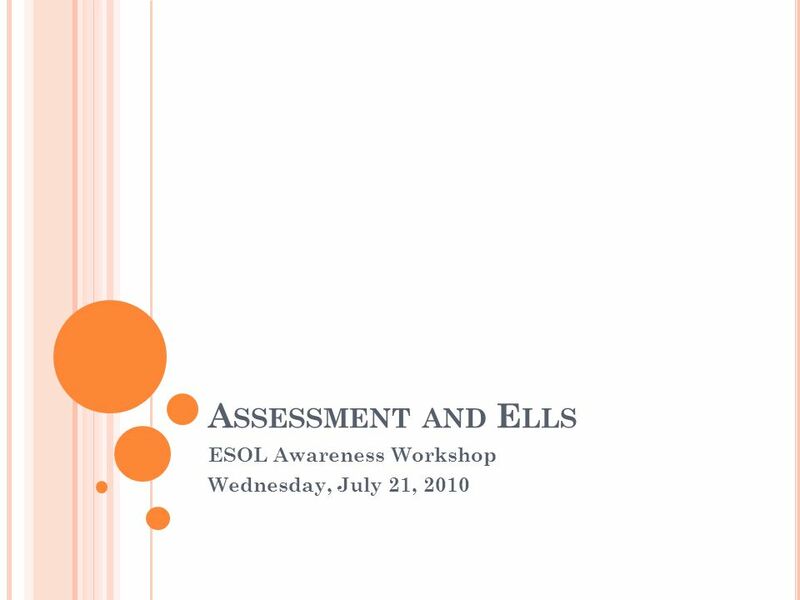 Download ppt "A SSESSMENT AND E LLS ESOL Awareness Workshop Wednesday, July 21, 2010." Dr. Dana Ferris University of California, Davis PREPARING TEACHERS TO TREAT ERRORS IN THE K-12 CLASSROOM. Teaching ESL Students What You Need to Know What is ELL The state of Tennessee defines ELL students as: –Those whose native language is other than English. From Elaboration to Collaboration: Understanding and Supporting Second Language Writers Alfredo Urzúa, Languages and Linguistics Kate Mangelsdorf, English. 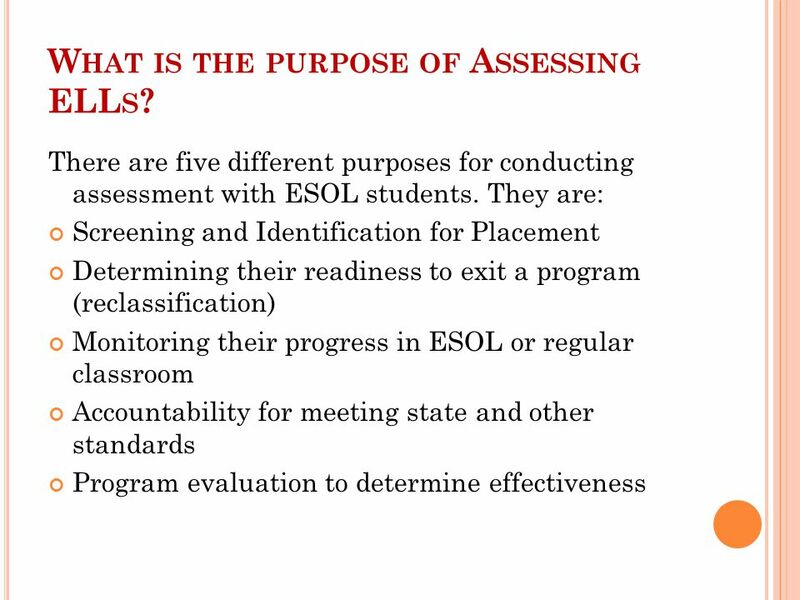 The English Language Proficiency Standards (ELPS) MODULE 2 ELPS and Assessments Presented by the Brownsville Independent School District Bilingual Department. ELL Program Radnor Township School District. The Koi Fish Story A favorite fish among many hobbyists is the Japanese carp, commonly known as the koi. SAT Strategy …so you don’t get pwnd. CLD extras. English as a Second Language (ESL) teachers must have special preparation to teach English to non-native speakers; being a fluent speaker. Daniel Boone Area School District English as a Second Language (ESL) Program. September, 2010 Accomack County Public Schools. DEFINITION OF AN LEP STUDENT  An LEP student is one: Who was not born in the U.S. or whose native language. Identification, Assessment and Re-classification of English Learners Initial Identification  Complete within 30 school days of enrollment Administer Home. Language and Content-Area Assessment Chapter 7 Kelly Mitchell PPS 6010 February 3, 2011.